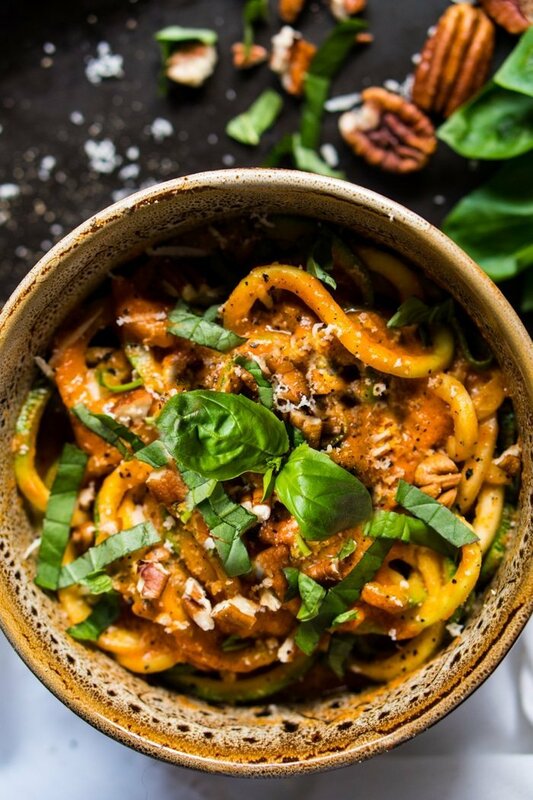 These keto zoodles with a creamy mascarpone sauce are both super tasty and super speedy. Think 15 minutes start-to-finish, making them an ideal weekday meal. 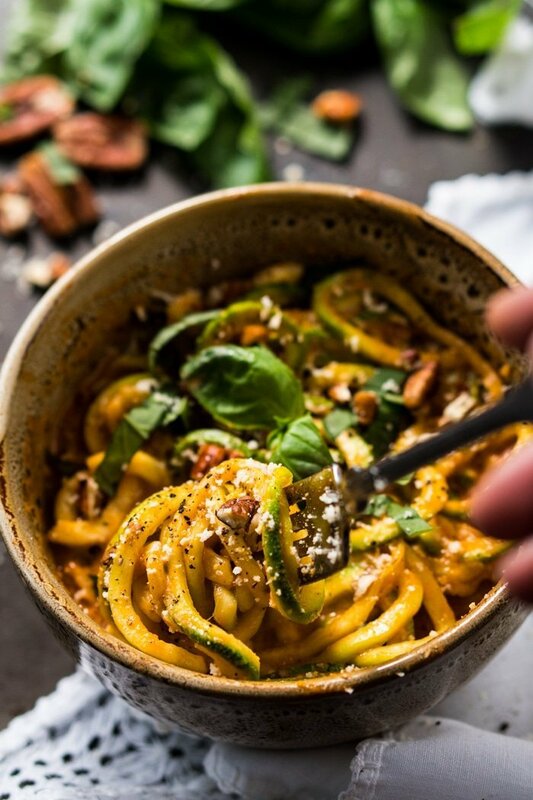 Zoodles are a staple keto meal here at gnom-gnom, as with a little sprucing up they make for a killer (and ultra speedy!) meal. Plus, they’re super versatile; remember our breakfast zoodles? The one trick to cooking up zoodles is to lightly sauté them in a little olive oil with garlic. Then remove them from the pan and drain any liquid. This way you avoid soggy zoodles and thinned-out sauces. 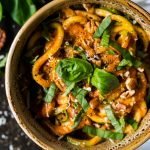 All in all, these keto zoodles are reason enough to always have some homemade marinara sauce handy, be it in the fridge or freezer. 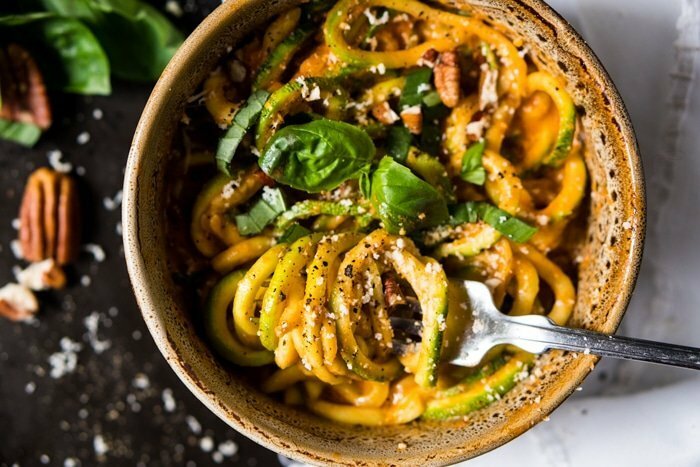 They’re as easy as cooking up the zoodles and mixing some marinara sauce with mascarpone cheese, topping off with pecans, basil and freshly-grated Parmesan cheese. Serve right away with freshly grated Parmesan, pecans, basil and black pepper. 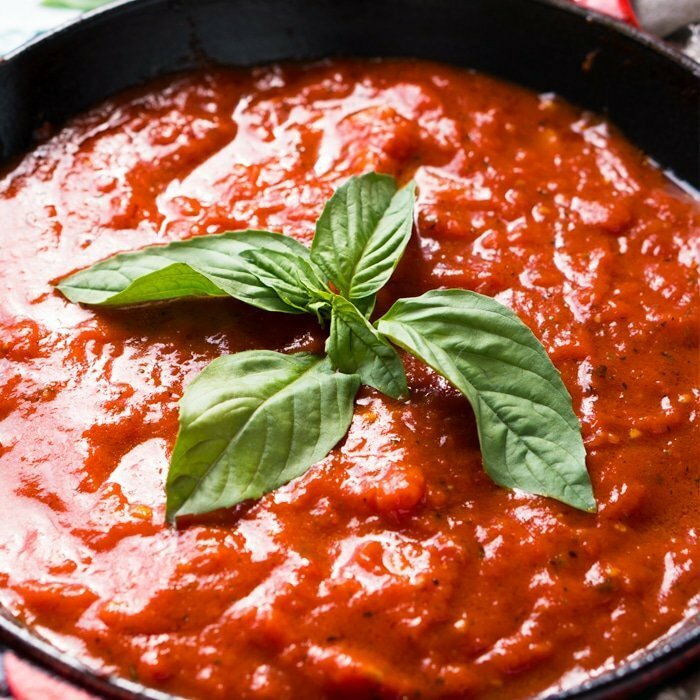 *Feel free to adjust the quantity of zoodles and marinara sauce to fit your macros (and tastebuds!). Similarly, please note that nutrition facts will vary widely for this recipe, depending on final quantities. THis was out of this world amazing!!!! Thank u!!! luv, luv luv everything we have tried so far! Quick question….what amount of zoodles and sauce is your nutrition facts based on? Knowing where you started will help me figure out where I am, I think! LOL! Thank you Carol! Too good xo! 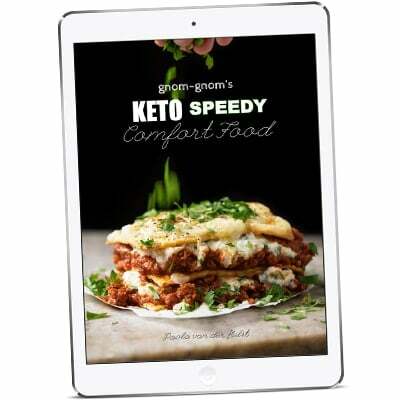 I’m new to keto eating and I would like to thank you so much for your easy and delicious recipes!! 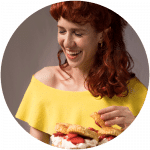 That’s awesome Murielle so happy you’re enjoying the recipes xo!